Although the LSWR obtained parliamentary authorisation to construct a line from Halwill & Beaworthy to Padstow in 1882 and opened the line as far as Wadebridge in 1894, it was to be a further five years before the line reached Padstow. The delay came about when plans submitted to Parliament in 1893 for a second line into the terminus, to link Padstow with Newquay and Truro, never materialised. 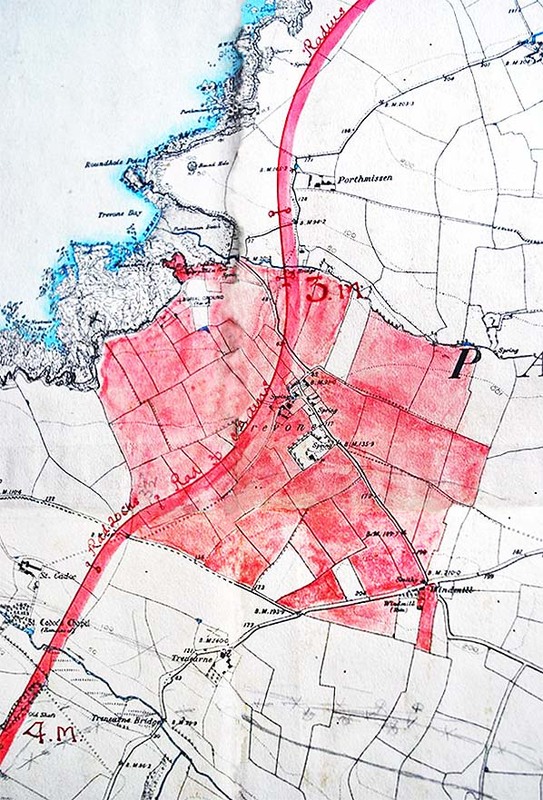 Around the same time, the time period specified by Parliament within which the North Cornwall Line was to be constructed lapsed and it became necessary to apply for fresh authorisation. 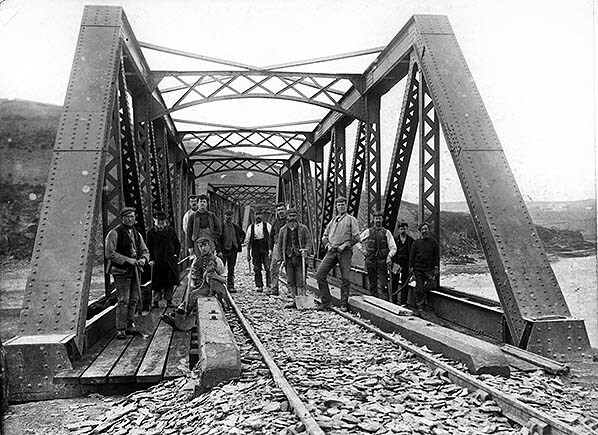 Under pressure from local residents, the LSWR obtained new approval in the form of the North Cornwall Railway Act 1896 which authorised the extension west over the main road in Wadebridge where a level crossing was to be installed. 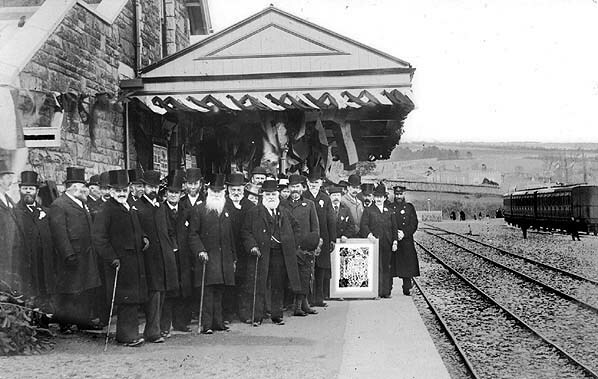 The line finally arrived in Padstow with its official opening on 23 March 1899; this was celebrated by crowds of local residents who gathered at the station to greet the first train. A brass band was also on hand and played 'See the conquering hero comes’. The first passenger trains began four days later on 27 March 1899. 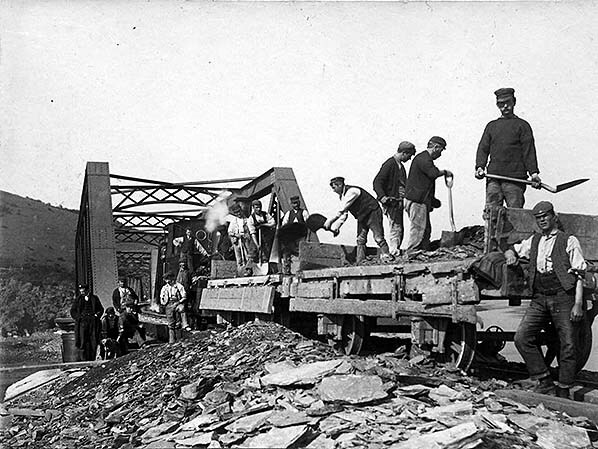 From the outset, the North Cornwall Railway was worked by the London & South Western Railway. The Port of Padstow was owned by the local landowners the Prideaux-Brunes, but was run by the Padstow Harbour Commissioners with whom the LSWR had a good working relationship. The new station had a single platform 300ft in length, with a building on the down side which was constructed to a standard design found at many stations on the North Cornwall Railway (NCR). It incorporated the stationmaster's house and station offices. The house was T-plan built in local rubble masonry, dressed on the corners and at openings, with a pitched slate roof. The single-storey office range was on the north side of the house and was of similar construction with a hipped slate roof. The office range included the booking office, parcel office and porters' room (entered from the end of the building) and general waiting room. There was a ladies’ waiting room in the lower floor of the house entered from the general waiting room. A single-storey wing, also in stone with a sloping roof, at the south end of the house, was for the gents’ toilet. A platform canopy decorated with saw-tooth valencing was also provided. At the north end of the platform, an 18-lever single-storey stone signal box with a Stevens frame controlled access to the goods yard and other sidings. The box was an LSWR Type 4, a very common type especially on the company's lines in Devon and Cornwall. Alongside the box, a corrugated iron lamp room with a timber front was sited at the back of the platform. At the rear of the platform at its south end was a small goods dock with cattle pens. This was served by a single siding which passed under a canopy in front of the goods shed, an LSWR Type 1. A second siding looped round the outside of the shed but this was removed in 1933. There was a small canopy on the other side of the shed to provide weather protection for road vehicles. Although the goods yard at Padstow was relatively small for a town of its size, Padstow was a fishing port with large quantities of outward-bound fish freight which often reached 1,000 wagonloads during a spring season. To accommodate this, a large timber fish shed, 160ft in length, was provided opposite the passenger platform alongside the dock. This had a canopy over a long loading dock on the land side and allowed fish to be unloaded from boats into the shed for auctioning and then packing and loading directly onto trains. The fish shed siding continued along the west side of the dock, terminating at a short jetty beyond the dock. Fishing vessels were able to unload on either side of the jetty. Padstow did not have an engine shed, but featured two different turntable sites and an associated loco siding and facilities. All evidence suggests that no enginemen were stationed there even on a daily basis, so these facilities were classed as a simple turning and minor servicing point. A turntable was recommended by the Board of Trade but it wasn't installed until 1900 when a 50ft turntable was built on the up side of the line, opposite the goods shed. A grounded coach body was provided alongside the turntable as a bothy for the engine men. In 1910 a carriage siding was added between the run-round loop and the fish shed. In 1910 the Padstow Harbour Commission in conjunction with the North Cornwall Railway obtained parliamentary authority to provide additional accommodation for fishing vessels, this included a wet dock. Between 1910 and 1915, the West Quay (inner dock wall) and a new railway jetty were built - this being paid for largely by the London & South Western Railway. Known as the 'new works', the West Quay was extended between 1910 and 1912 and the new railway jetty was built between 1912 and 1915 to accommodate two railway sidings which were in place by 1914. In order to provide rail access it was necessary to move the turntable some distance to the south. This was done in 1914 when the original 50' turntable was lifted out of the old pit and placed in the newly prepared pit to the south. There was an ash pit under the track and ash bin alongside on the approach to the turntable and, some time in the 1930s, a water tower was provided beyond the turntable. This comprised a cast iron tank on top of a lattice tower, the base of which was surrounded by a brick wall. The Metropole Hotel overlooks the station to the north. Certain details of the hotel in its early days are shrouded in mystery. Apparently originally named the South Western Hotel (see the 1905 OS map), the hotel's own website states, at the time of writing, that it was built between 1900 and 1904 for ship owners John Cory & Sons but makes no mention of the South Western name. One could be forgiven for assuming the name 'South Western Hotel' meant that it was a railway hotel, i.e. owned by the railway, but this was not the case and it should be remembered that initially the LSWR only worked the line; it did not own it until 1922. The hotel would probably have been built because of the coming of the railway but the 'South Western Hotel' name most likely had its origins in the hotel simply being located in the south-west. The name may, however, have been decided upon by agreement with the LSWR. The South Western name also appears on period postcard views. Quite when the ‘Metropole’ name was assumed is unclear. The hotel was sold to Trust House in 1936 and requisitioned by the Admiralty during the Second World War. The West Quay was further extended in 1928, and a 'bull-nose' was added to the railway jetty in 1935. Amongst other things, the railway jetty incorporated a wagon weighbridge. In 1922 the majority of railways in Great Britain were amalgamated into four. In connection with the formation of the Southern Railway, the NCR was finally absorbed by the L&SWR which in turn was absorbed into the Southern Railway. The NCR was formally wound up on 6 March 1923. The station's heyday was around the time of the railway grouping when it saw substantial passenger traffic in the form of holidaymakers and daytrippers to the coast. The station was served by the famous Atlantic Coast Express, a direct service from Waterloo. When the Southern Railway took over responsibility of the North Cornwall Line and stations they decided, given the levels of fish traffic at Padstow, to extend the fish shed by 100ft, this was completed in the early 1930s. On the site of the old turntable local fish merchant Pawlyn Brothers erected a number of timber buildings for a fish curing depot. There were two types of passenger train service throughout the life of Padstow Station with through trains to Okehampton, Exeter or Waterloo and local trains to Wadebridge and Bodmin North. Apart from the usual general freight, there were perishable goods dispatched daily on the 'Up Perisher' - the 3:13 p.m. passenger service from Padstow - and fish which was dispatched daily on the 4:30 p.m. fish van train. Southern/Western National buses were outstationed at Padstow station from 1935. Outstations were places were buses and crews were based away from the main depots and were often located on railway, or former railway, land. In 1947 the turntable pit was enlarged and a new 65ft turntable installed to accommodate Bulleid Pacifics. The jetty wall was partially rebuilt to make room for this. An early 1950s photograph shows a narrow slit in the brick wall facing the turntable. Its purpose is unknown, but the wall resembles what is known as a 'loopholed wall' which would have been used by a Home Guard rifleman during WW2 as part of the defence of the station. By the late 1950s the slit had been enlarged into a window. At nationalisation in 1948, Padstow station became part of the Southern Region of British Railways. A number of major regional boundary changes took place on 2 April 1950, one of which was the transfer of all of the former Southern Railway lines west of Exeter (including Padstow, of course) to the Western Region. However, on 2 February 1958 these lines reverted to Southern Region administration, only to return to the Western Region on 1 January 1963. Although the neighbouring Wadebridge station was fitted with BR Southern Region totems during the 1958-62 period, Padstow did not receive them. Rationalisation meant that the competing lines of the Western Region and Southern Region in Devon and Cornwall could not survive indefinitely. Declining fish traffic in the 1950s saw the severing of the siding serving the fish shed c1964 and the removal of the canopy on the rail side of the goods shed. The cutbacks accelerated once the station was transferred to the Western Region of British Railways in 1963. The Beeching Report proposed the closure of Padstow station and the lines serving it. Closure started in 1964 with the withdrawal of goods traffic from 7 September and the last running of the Atlantic Coast Express on 5 September and most of other through passenger trains to Waterloo. At the beginning of 1965, DMUs replaced steam-hauled services and for the first time in its history, the North Cornwall line had some trains (when single-unit DMUs of classes 121/2, nicknamed 'bubble cars', were diagrammed) which were only second class and contained no toilets. Padstow signal box was abolished and replaced by a ground frame unlocked by an Annetts key attached to the train staff sometime between August and December 1965. After closure it was quickly demolished. The runround loop left in situ for use of by the Bodmin school train which was loco hauled. Closure to passengers of the Bodmin Road – Padstow line was formally proposed on 21 October 1965, and on 15 September 1966 Barbara Castle, Minister of Transport, gave consent. All through services ceased in September 1966 and the North Cornwall line closed completely at the beginning of October 1966; by then the only trains which served Padstow were local trains from Bodmin Road which reversed at Bodmin General to continue to Wadebridge and Padstow. The final railtour into Padstow was the 'North Cornwall Farewell Railtour' on 1 Oct 1966. The final trains to Padstow were on the 28 January 1967 and the line officially closed two days later. The track was lifted circa early 1968, and within a few years the trackbed was being used for car parking while the station forecourt remained an outstation for Western National buses. Through the 1970s the station building was boarded up and out of use and circa 1976 the south end of the platform was demolished. The station building eventually found a new use as a cycle-hire shop. The trackbed leading into Padstow now forms part of the Camel Trail, a recreational route for walkers, cyclists and horse riders. In 1977 the station buildings were purchased by Padstow Town Council and the Padstow Echo (No 44) reported 'The Station House has been made secure and the first floor will be made into new Council Offices.' The Council eventually moved from North Quay into Station House c1979. Externally the building remained largely unaltered but there were internal modifications with the council chamber located where the booking office and waiting room once were. The lower floor of the stationmaster's house was used as council offices with the upper floor being used for storage. The fish shed, part of which had been used as a base for Padstow Cycle Hire, was demolished in 2000. The Railway Heritage Trust described the station building as ‘one of the last remaining relics of the Southern Railway in Cornwall’. Despite this, the building was assessed for listing in 2012, but failed to meet the required criteria. The Council were forced to move out of the building in September 2012 because of naturally occurring radioactive radon gas which was four times higher than the recommended levels. There was also a broken sewer and unsafe electrical wiring. Demolition was considered but the town council has been told the high radon and electrical problems can easily be rectified. Refurbishment of the building started in January 2016. The Town Council are planning to move back into the building once refurbishment has been completed. The building has been completely stripped to address dry rot and damp issues. Future plans now include a double extension which will involve demolition of the public toilets (the old gents' toilet). Click here to see council presentation slides. Plans have been mooted by the current Bodmin & Wenford Railway to reopen the line to Padstow, but this is unlikely as a new route through Wadebridge would have to be found. The return of trains to Wadebridge following the line of the Camel Trail is highly likely, but not to Padstow. When the line opened in the spring of 1899, the LSWR ran six up trains and seven down trains daily to and from Okehampton. On Sundays, it is possible that there were five up trains and four down trains - but records from the time are confusing as to whether a Sunday service ran or not. For the remainder of its existence, Padstow Station was normally closed on Sundays. In later years rail tickets to Bodmin, Wadebridge and Padstow were sold on, and valid on, Sundays via Bodmin Road. Passengers travelling to/from Padstow used a Western National bus which ran for this purpose and connected with trains at Bodmin Road. In LSWR days in the summer of 1914, there were six up trains and seven down trains to and from Okehampton, Exeter and Waterloo, but they was supplemented by local services to Wadebridge and Bodmin North giving a total of 12 up and 11 down trains daily. There were no trains on Sundays. In the summer of 1932, the Southern Railway maintained the service although it was now seven up trains and six down trains. On weekdays the 3.13 p.m. departure was known as the 'Up Perisher' - the passenger coaches going to Exeter, with the vans which formed the rest of the train destined for Templecombe and/or London (see section on freight). There were also five local trains daily to/from Bodmin North. The working timetable for the summer of 1932 does show two Padstow trains on a Sunday - a half-day excursion to Paignton, which ran via Halwill, Okehampton and Exeter St. David's, and a half-day excursion from Exmouth to Padstow. This was not uncommon on lines normally closed on Sundays. In BR days the winter service had been cut back to only four trains a day over the North Cornwall line in each direction, although two of these were to/from Waterloo the other two were to/from Okehampton or Exeter. In addition, there were eight up local trains and ten down local trains - two of which travelled to/from Bodmin Road (WR). Unlike most stations which just dealt with general freight, cattle etc., Padstow was associated with two specific types of freight throughout its history for which particular trains ran. On Monday-to-Saturday during part of Southern Railway and British Railways days the 11.00 am Waterloo to West of England service - which was known as the Atlantic Coast Express (the ACE) - was the most multi-portioned train in the world with coaches for Plymouth, Padstow, Bude, Torrington, Ilfracombe, Exeter Central (two kitchen/restaurant cars), Exmouth, Sidmouth and Exeter - the latter single coach being detached at Salisbury at 12.23 pm and added to a local all-stations train to Exeter Central which left 13 minutes later at 12.36 pm. In winter the ACE consisted of 13 coaches with three coaches for Ilfracombe, two for Plymouth, the two kitchen/restaurant cars for Exeter, and a single brake-composite coach for each of the other six destinations - including Padstow with arrival at 5.00 pm. On busy summer Saturdays the train ran in four portions with many coaches for each of the destinations. In BR days at the height of holiday season, the 11.00 am Saturday departure from Padstow to Waterloo consisted of eight coaches including a kitchen car and a composite restaurant car. It was usually hauled by a West Country Pacific loco although a photo exists showing the train hauled by a pair of N-Class 2-6-0 locos. 1. 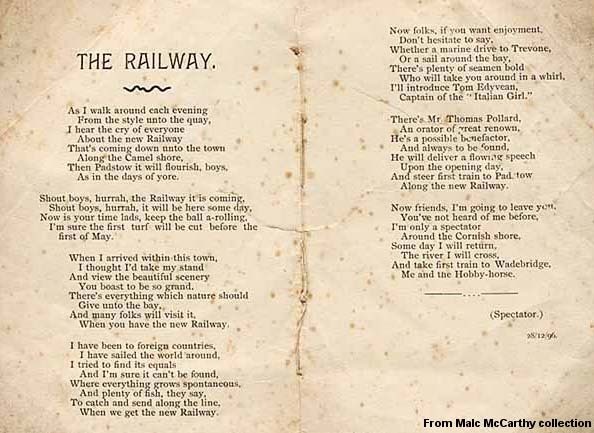 Perishable goods were shipped daily in vans attached on the front of the 3.13 pm up passenger train which was known to railwaymen as the 'Up Perisher'. This train originated at Padstow, and picked up other perishable goods en-route. The 3.13 pm passenger train went as far as Exeter but the vans continued further afield to Templecombe (for the S&DJR) and London. In the summer of 1956, this included the returning VAN B which arrived on the 1.15 am ex-Waterloo newspaper train and other vans for the perishable goods. At Halwill Junction, it was common practice for a number of Conflat wagons with containers - containing meat from the slaughter house in the yard - to be added to the 'Up Perisher'. The 6.00 pm passenger departure from Padstow also carried vans - in 1956, this was a VAN B for Exeter and a BY for Nine Elms. The large fish shed at Padstow generated much fish traffic and, to accommodate this, a fish van train departed Padstow at 4.30 pm daily destined for Nine Elms. As early as the year of opening in 1899, the LSWR realised the importance of the freight traffic and put on a fast afternoon goods train leaving Padstow at 3.30 pm calling only at Wadebridge, Camelford, Delabole and Launceston. This train joined with the Plymouth-Nine Elms freight at Meldon Junction for a fast run to London. Regular outgoing traffic also included cattle and rabbits while a major source of inbound traffic was China Clay but this traffic was lost to Fowey and Par in 1936. Pope & Sons were LSWR and SR general cartage agents. Pope also ran buses. Hobson & Co. (Lowestoft), Lowestoft Fish Selling Co. Ltd. and Lowestoft Coaling Co. Ltd. all had a presence at Padstow. Grimsby Coal, Salt and Tanning Co. also had a presence at Padstow and dealt with ship's chandlery. General merchants Messrs. Bray & Parken received rail-borne goods. They also imported coal by coastal vessel until the 1940s. A wide range of motive power was to be seen at Padstow and many, but by no means all types, can be seen in the images that follow. With the exception of former LSWR and SR types which continued to appear following nationalisation, the BR period is somewhat less well documented. The Southern Region had a number of BR Standard 2-6-2T types as will as several 4MT 2-6-4Ts and these operated alongside some of the LMS-designed Ivatt 2-6-2Ts. All these were frequently photographed at Halwill, Okehampton, Bude, Torrington and so forth but, photographic evidence suggests, their visits to Padstow were infrequent. Photographic evidence does exist of a 4MT 2-6-4T and an Ivatt 2-6-2T at Padstow or on the line between there and Wadebridge. Following Western Region (WR) takeover these machines came under that region's auspices and this was the first time the 4MT tanks had officially operated on the WR, this being the only BR region not to receive any from new. The takeover by the WR not only saw diesel multiple units (and ex-GWR hauled stock) at Padstow but also Prairie tanks. Pannier tanks also lurked on the Bodmin - Wadebridge and Wenford section and these were also to be seen at Padstow. They had taken over the duties of the Beattie well tanks until usurped by diesel shunters of classes 03 and 08 from St Blazey shed. AC Cars diesel railbuses pottered around Bodmin and are also known to have run to Wadebridge but no evidence of their pottering to Padstow has been found. Main line diesel locomotives known to have visited Padstow were the North British Type 2, later class 22, and as far as is known were the only main line type to do so. It was one of these locomotives, No. D6309, which operated the final passenger train from Padstow in January 1967 and hauling, as if to have the last laugh, ex-GWR stock. This was, of course, also the final regular passenger train over the Wadebridge - Bodmin Road section. Special thanks to local author Malcolm McCarthy for giving me access to his collection of photographs. Malcolm has written numerous books about Padstow. Also Darren Kitson for writing and researching many of the captions. 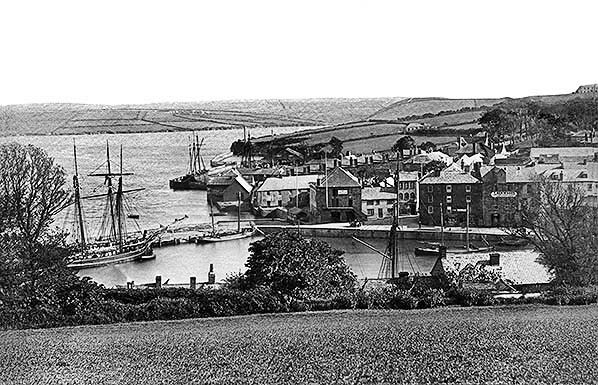 A view of Padstow Harbour looking south prior to the arrival of the railway and circa 1880. The railway station was to occupy the strip of what was then creek just left of centre and behind the buildings. A little further left of centre a gated dock with a ship can be seen. Both it, and that left foreground, appear to be schooners. It is not entirely clear if the dry dock was such in the true sense of the term or was gated simply to maintain water level irrespective of the tide. The location of the dry dock was to become the site of the railway jetty. With the coming of the railway the dry dock gate was removed and the entrance widened, presumably to allow the fishing vessels direct access to the fish shed opposite the station. The result of this alteration, pre-jetty, can be seen in the photograph taken from St Saviour's. The above view is from the same area but a little further west. An 1881 1:2,500 OS map showing what was to become the site of Padstow station. Maps of this age tend to lack detail but we must remember techniques were relatively crude and many cities, towns and villages did not expand until the coming of the railways. Padstow was originally built on a creek and was very susceptible to flooding and in due course the town expanded onto higher ground. The flooding problem persisted until the late twentieth century when the present flood defences were constructed. The 1881 map gives an idea of the then situation with the creeks and the Camel. The speckled area represents mud flats, exposed at low tide and flooded at high tide. Note that a creek runs a little inland serving two timber ponds and a (ship) yard. This stretch of creek was reclaimed and the railway was built on it. What had been one wall of the shipyard became the retaining wall along the west side of the railway. In effect, Padstow station was built in a former tidal dock. Timber ponds are a relic of the pre-mechanisation days of wooden ship- and boat-building. Timber was brought in by sea, unloaded in the estuary, lashed together and floated to the timber ponds. Here it was graded according to its eventual use, time required for seasoning and so on. Seasoning is basically the time needed for freshly felled timber to stabilise and cease warping. Timber ponds may, to modern eyes, seem a strange way to store timber but in age when power meant man or beast they were an easy answer to what we today call 'stock rotation'. Once a common sight wherever wooden boats and ships were built, today just a few rotting remains can be seen in a small number of locations. Towards top left of the map a limekiln can be seen. Such kilns burned calcium carbonate (limestone, chalk etc) to produce quicklime which was used in agriculture and the building trade. Quicklime burns the skin and has also been used in mass graves to prevent spread of disease during epidemics as well as for disposal of corpses for more sinister reasons. Limekilns were once small, local affairs situated close to where it was needed but they are now a relic of the past with today's requirements produced by mechanised plant. Details of limekilns can be read on this website's Dunton Green pages. out many of the words.